The Pennsylvania Department of Environmental Protection (DEP) recently released its 2017 annual oil and natural gas report, and like DEP’s 2016 report, it is full of great news for the Commonwealth. In particular, the report shows Pennsylvania’s unconventional industry is not only experiencing record-breaking production, it’s doing so while maintaining “a strong 95 percent compliance rate” on DEP inspections. Pa. natural gas production is skyrocketing. In 2017, Pennsylvania’s unconventional industry produced 5.36 trillion cubic feet (Tcf) of natural gas – second only to Texas in U.S. natural gas production. That’s a five percent increase over the state’s 2016 production and a 1,360 percent increase since 2010. Incredibly, this has trend continued in 2018. 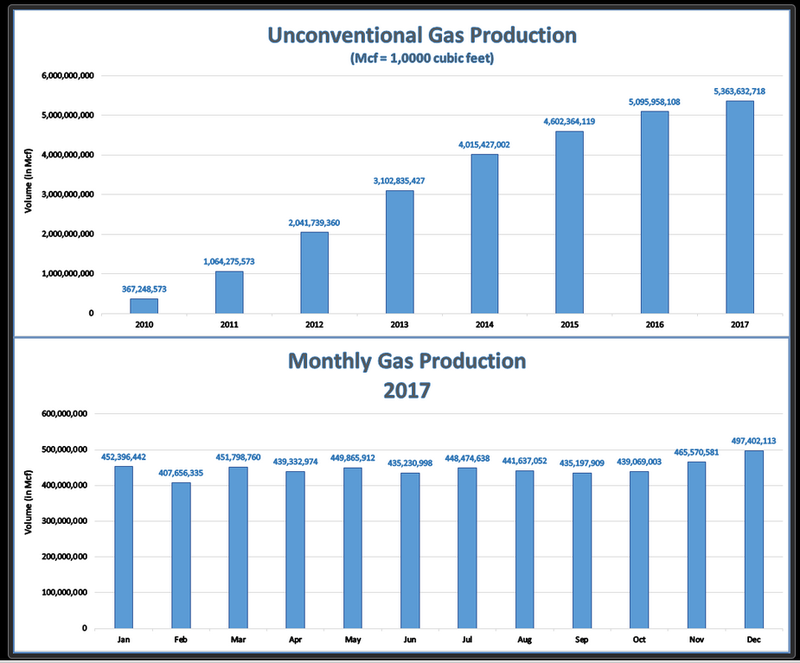 DEP’s January through June production data show the state produced 2.9 Tcf during those months, compared to 2.6 Tcf during the same timeframe in 2017, representing about a 10 percent increase in production levels for the first half of 2018. Southwest Pa. saw the most new shale wells drilled. There were 810 new unconventional shale wells drilled in Pennsylvania in 2017, compared to 503 in 2016. Washington (209) and Greene (158) counties in Southwest Pa. (SWPA) saw the most new wells drilled in 2017, followed by Susquehanna County (94) in Northeast Pa. (NEPA). While much of the focus of the last decade has been on the Marcellus Shale, about five percent of the new wells drilled in 2017 were in Pa.’s share of the Utica Shale. As was the case in 2016, Potter County (17) saw the most new Utica Shale wells drilled in 2017, followed by Tioga County (10). Permits issued in 2017 were more than double 2016. 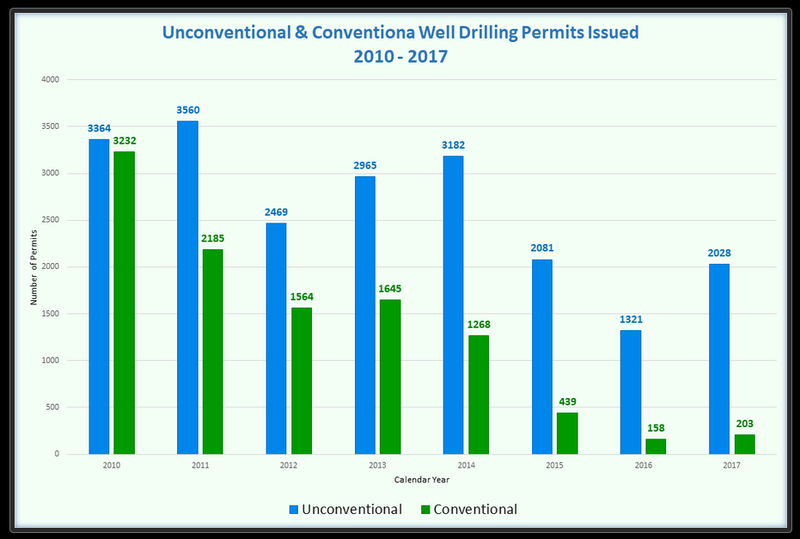 DEP issued about 58 percent less unconventional permits in 2016 than in 2014, following a trend of decreased permitting. But that number is once again on the rise, with 2017 seeing 2,028 permits issued – or about 53 percent more permits than were issued in 2016. SWPA had the most permits issued in 2017. The top counties for permits issued were Washington (515), Greene (453), Susquehanna (194), Butler (122), Allegheny (117) and Tioga (112). 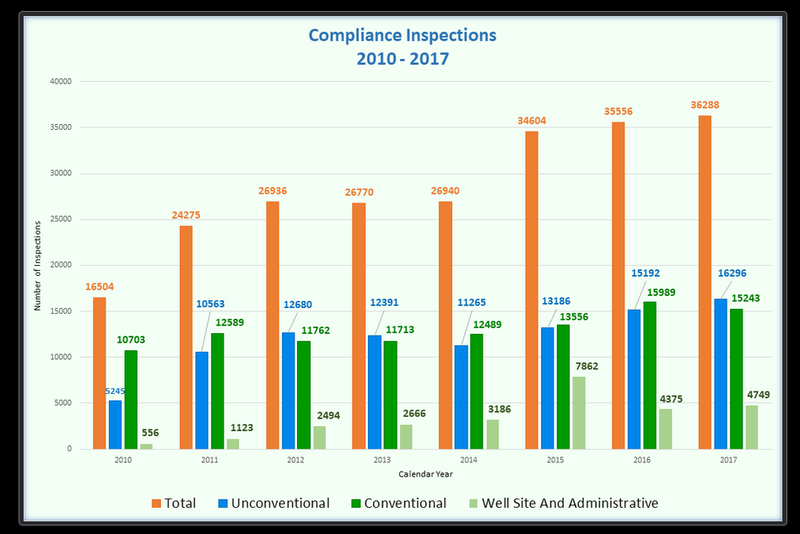 As DEP explained in its report, all of this uptick in activity has occurred while the industry has maintained a 95 percent compliance rate – and that’s despite DEP conducting increasingly more inspections each year. Also in July, the Pennsylvania Department of Health and the DEP released two companion reports on shale development in the Commonwealth that have encouraging findings: There is little risk of shale development harming public health. DEP’s report included data for long-term air monitoring of Marcellus sites in Washington County, while the DOH’s report analyzed that data for potential health impacts. In April, the DEP released its comprehensive analysis of the structural integrity of shale wells across the Commonwealth. The Mechanical Integrity Assessment Program report “shows that the majority of wells in the state are being operated in a manner that greatly reduces the risk for groundwater impacts,” according to DEP. All told, the last decade of shale has created incredible opportunities for the Commonwealth, while proving time and again that the industry can and does operate in a manner that is protective of our environment and health. And with 2018 already on a path to once again shatter previous production records, and new investments being made in infrastructure for midstream and downstream projects, it would appear that the best parts of this story have yet to be written.